On a damp evening in mid-December, within a densely packed east-Vancouver neighbourhood, the Ukranian Cultural Centre is filled with songs from coastal communities along the western side of Vancouver Island. The 89-year-old venue was one of five used in December for Nuu-chah-nulh-aht living in cities away from their nations’ hahoulthee. George Watts lends his voice to the singing, as two-year-old Lorrenzo mimics his father, banging a drum at George’s ankles. 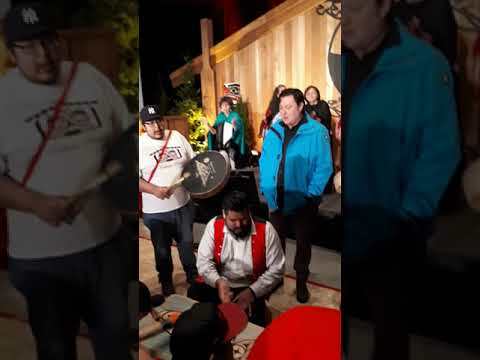 “I do a lot of singing and drumming myself to teach my kids all of my family songs,” said George, who is a member of the Tseshaht First Nation. Seeking work and educational opportunities, George moved to the Lower Mainland half a year ago with his partner, Kelsey Martin, Lorrenzo and their other son, one-year-old Hunter. It’s been an adjustment for the young family, as George and Kelsey grew up in Port Alberni. For Connie Charleson, the evening’s singing, drumming and dancing feel like home. “It lifts my spirits,” said Charleson, who moved from Port Alberni to the Vancouver area 18 years ago to study fashion design at Quantlin University. Despite the strong connections that are often present in Nuu-chah-nulth families, many members venture far from home. The Nuu-chah-nulth Tribal Council’s lists just 3,340 of the 10,000 status members residing on reserve. Approximately 27 per cent live in Port Alberni, while Nanaimo, Campbell River and the City of Victoria draw nine, three and eight per cent of Nuu-chah-nulth-aht, according to the Ha-Shilth-Sa’s records, which provides subscriptions to the members of most Nuu-chah-nulth nations. Another five per cent of Nuu-chah-nulth live within in the cities of Vancouver and North Vancouver, with hundreds more residing in other surrounding municipalities that comprise the Lower Mainland. To help sustain connections with those who live in larger cities, Teechuktl holds urban gathering each December in Nanaimo, Campbell River, Vancouver, Seattle and Victoria. Besides a hot meal and plenty of Nuu-chah-nulth singing and dancing, the NTC and other service providers disperse helpful information, status cards are updated, and Teechuktl staff provide brushing as well as other cultural support for those who need it. The urban gatherings started in the mid-1990s at a time when the Nuu-chah-nulth Treaty Table held meetings in various locations. In 1999 Robinson was brought in as an outreach coordinator with the Healing Project, an initiative that travelled with the treaty table to provide support for Nuu-chah-nulth members. The urban gatherings stopped in 2005 when funding ceased for the Healing Project, but the annual events for big-city dwellers returned in 2008 with the introduction of the Quu’asa program, which is run by the Teeckuktl department that Robinson now manages. “This time of the year is really difficult for a lot of our people,” she said. Despite these challenges, Nuu-chah-nulth-aht are venturing to larger cities for the options they offer. “Some leave the community because they are pursuing health supports, education, the children are pursuing sports, different housing, employment,” noted Wylie. It was more opportunity in work and education that brought George Watts’ family to the Vancouver area. Kelsey Martin and George work in the surveying industry. Vancouver’s vibrancy helped the young family adjust to the change in environment from Port Alberni.